Welcome to tropical paradise! I invite you to feast on this delicious Chia seeds pudding with coconut milk and fresh Alphonso mangoes straight from India. Chia seeds pudding is simple and can easily be adapted to include your favorite fruits and toppings. A lot like the overnight oats recipe. In this recipe, I make the basic chia seeds pudding by combining chia seeds with agave syrup and coconut milk. And then later top it with mango pulp. In Mayan language, Chia means “strength” and chia seeds have been traditionally used as an energy food by Native American communities. Long distance runners use them for sustenance. They are power-packed with antioxidants, fiber, proteins, calcium, omega-3s, and many other vitamins and minerals. You can sprinkle them to smoothies, breakfast bowls, salads, and also add to your cakes and muffins. Mangoes and coconut milk give this pudding a tropical flavor. You can use any non-dairy milk or regular milk too. Apart from mango, I also want to try the chia seeds pudding with berries. They are in season and a very berry chia seeds pudding will be awesome too! What other fruit would you recommend? 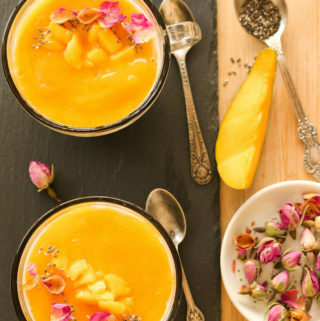 This mango and chia seeds pudding is like a tropical paradise! Healthy, delicious, made with just 4 ingredients, and in less than 10 mins, it can be served as breakfast, or snack, or a dessert! You choose. For the basic chia seeds pudding, add 1 tbsp chia seeds, 1½ tsp agave syrup, and ¼ cup coconut milk per serving in individual cups. Peel, chop and puree the mangoes. Keep a few mango pieces aside for garnish. After 4 hours, take out the basic chia seeds pudding from the refrigerator. Mix well. It will have a thick gelatinous texture. 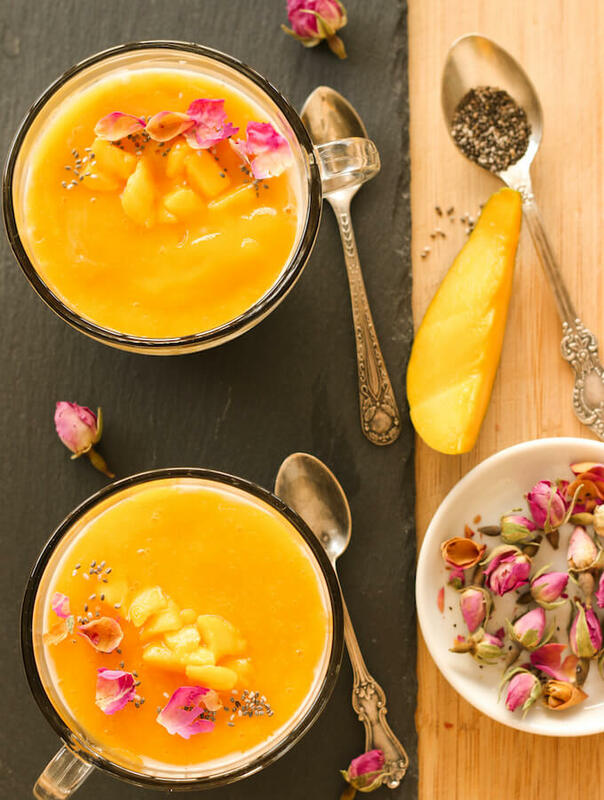 Top with mango pulp and garnish with the remaining mango pieces, few chia seeds and rose petals. Serve cold. The best way to use dry whole Chia seeds is to soak them for at least 3-4 hours before using them. Like many nuts and seeds, Chia seeds contain anti-nutrients called phytates that block the absorption of certain nutrients. Soaking helps remove these anti-nutrients. Chia seeds are also hydrophilic, which is why they swell up when soaked and are great to make healthy gluten-free gelatinous puddings. If you are using them without soaking, or in recipes that do not have a lot of water, drink water after eating the seeds. Powdered or ground chia seeds can be used without soaking. I like to use ground seeds mostly as a thickener when I don’t want the texture of whole chia seeds in the dish. Too much of chia seeds may lead to uneasiness so like every good thing, eat them in moderation. oh how I love Mango, if I could ever have enough not to eat them all I would love to try this. I can eat mango every day and night and this sounds heavenly! I so so love mangoes 🙂 This is a great way of making a fulfilling breakfast with chia, and coconut milk, and the delicious mangoes! I am a bit sad that we are nearing the end of the season 😮 I hope you’ve had a lot of them! I really love the flavor of mango! I have never had mango and chia seeds together but I bet it tastes wonderful! I think mango makes everything great! 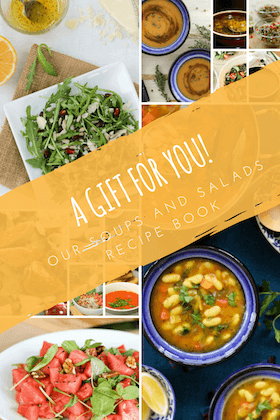 🙂 From chia puddings to ice creams to smoothies… I hope you try out this simple recipe! Looks so vibrant! And what a delicious way to start the day 🙂 Love that it’s healthy too! 4-ingredient recipes are the best! Love the simplicity and delicious flavors in this dessert. It’s beautiful too. I love mangoes and this truly does look like a tropical paradise! i must try this!